Protect exterior paint and wheels/rims with technology that outlasts competitive products. Others last for 4-5 years and recommend maintenance and touch-up every 4 to 5 months. It's technology that makes the difference. 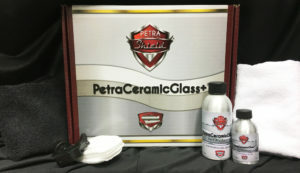 PetraCeramicGlass+ is a coating made with proprietary blend of hybrid of ceramic and glass compounds. These compounds have a strong bonding ability to automotive surfaces, and won't peel off like competitive aftermarket treatments.